This book chronicles significant events in Australia’s history beginning 225-220 million years ago with the formation of Gondwanaland. 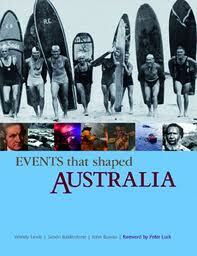 You can read about the Great Depression; Eddie Mabo; the shearers’ strikes of the 1890’s; Cyclone Tracy; Dame Nellie Melba; the birth of the Ashes; the fight for the Franklin River; Maralinga; Ned Kelly; the Tampa crisis and many other indigenous, political, social, sporting and cultural milestones. It was co-written with the very talented duo of Simon Balderstone and John Bowan. And I know Simon and John would join with me in sending a special ‘thank you’ to the ever-inspirational Lewis Bolston. You can buy the expanded and revised new edition here or here or here.